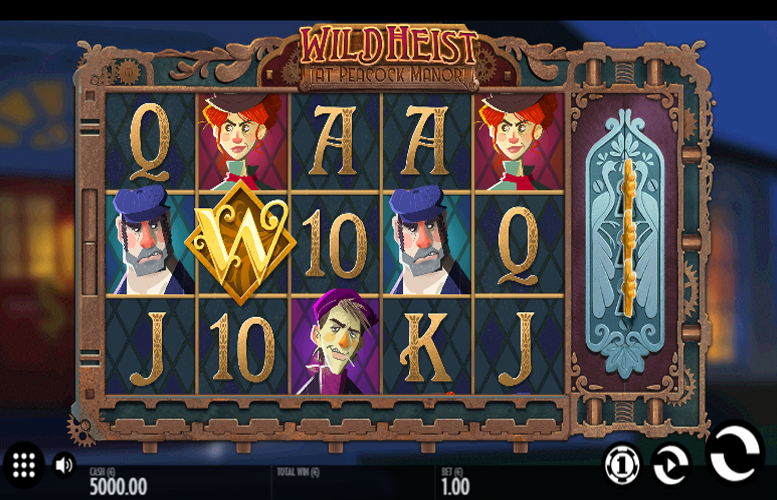 There’s a robbery going down on the Wild Heist at Peacock Manor slot machine from Thunderkick. Presumably those behind it are hunting for riches just like you! The game itself is played over a five reel, three row grid. The artwork is great, and the music creates a suitably sneaky feel to the action. Then there are the game’s special features. If you like a range of innovative gameplay touches and diverse “wild” functions, you’re in the right place. This slot is likely going to become an instant favourite of yours. Loads going on. Just look at how many different combinations of bonus features can be active at once. This game has some serious replay value! Great look and feel. The music and artwork come together to create a winning title. Small main game prizes. You can’t have it all though. With so many features on the Wild Heist at Peacock Manor slot, we can forgive the minute prizes. Stacked Peacock = 20x the total bet. Any “Wild” symbol = 20x the total bet. Red bandit = 17.5x the total bet. Purple bandit = 15x the total bet. Green bandit = 12.5x the total bet. Blue bandit = 10x the total bet. 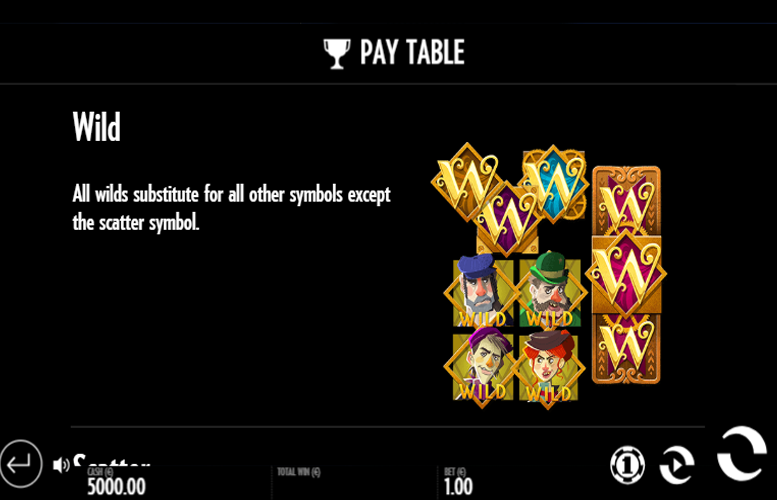 Landing three or more “scatter” symbols anywhere on the reels will trigger the Wild Heist at Peacock Manor Bonus Game. This special feature is a free spins round. 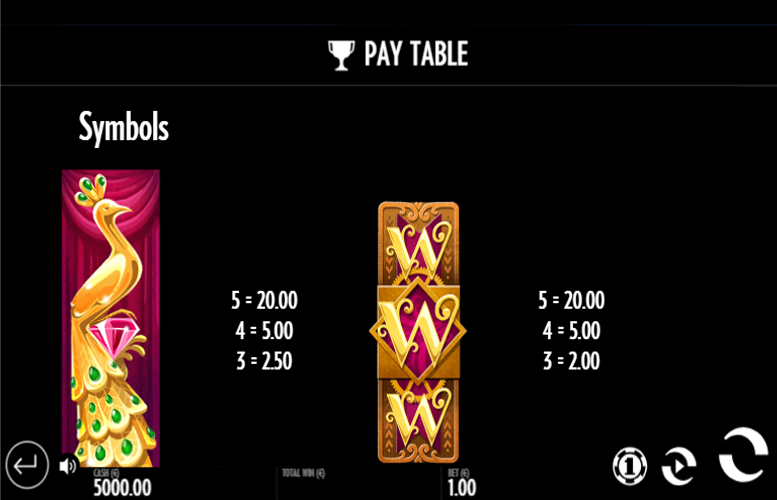 When entering the Bonus Game, the player gets to pick three cards to customise the special feature. Each additional “scatter” symbol grants one additional pick up to a maximum of five selections. Players will be presented with five face down playing cards. They must select between three and five of these, depending on how many “scatter” symbols triggered the feature. Amongst the prizes featured under the cards are extra free spins, additional multipliers on each win, a Mystery feature, and a mid-win symbol being transformed into a “wild”. 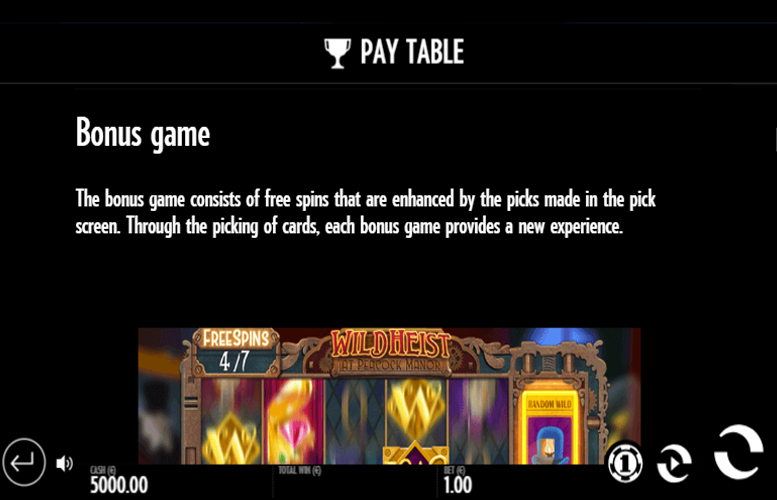 The Bonus Game is a free spin round enhanced by the picks made in the selection screen. Through the picking of cards, each Bonus Game provides a different experience. This creates a game with a lot of replay value. 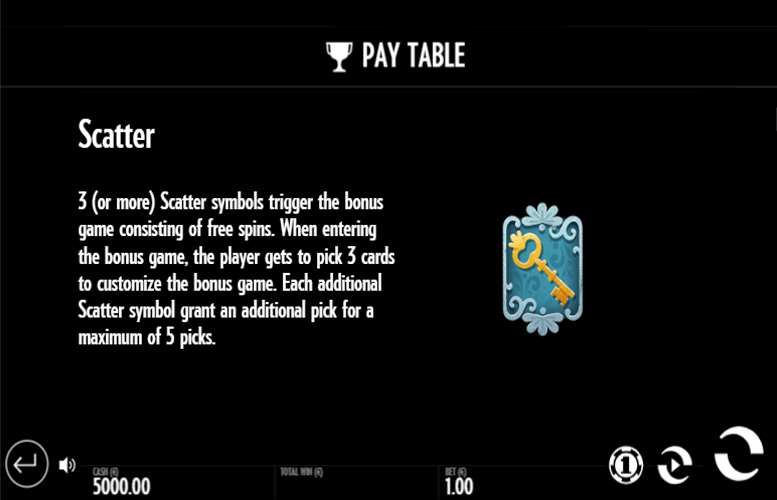 Landing two or more “scatter” symbols anywhere on the reels during the free spin mode will trigger an additional selection from the feature cards. The default number of re-picks for two “scatters” is one. However, this increases for every additional “scatter” landed. The maximum is four. During the main game, one of several random special features can be triggered. We’ve listed each and their effects below. During a “Wild” Reels spin, up to three whole reels can be turned into “wild” symbols. The “Wild” Reel is placed on top of the reel, replacing all symbols beneath it. During a Random “Wilds” spin, up to seven “wilds” will be randomly placed on the reels. Each Walking “Wild” symbol will move one step to the left. 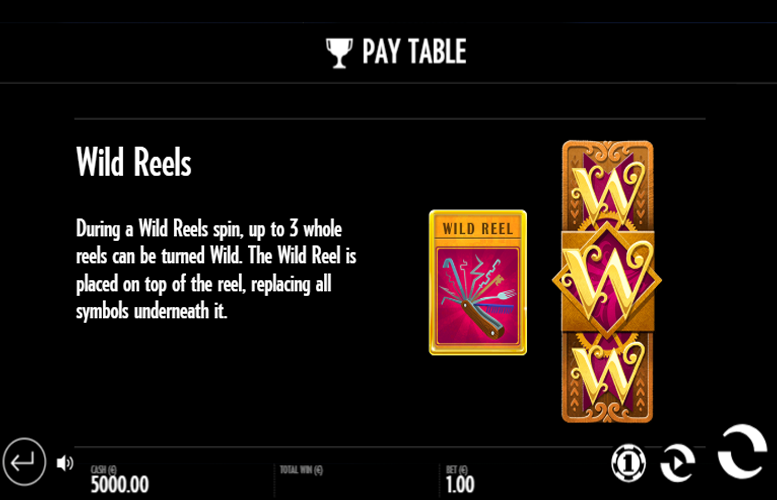 Re-spins will be continually granted until there are no more “wilds” active. King = 4.5x the total bet. Queen = 4x the total bet. Jack = 3.5x the total bet. Ten = 3x the total bet. In terms of bet distributions, the choices are rather limited on this title. Rather than provide options to adjust the number of win lines played or the amount bet on each one, instead there is just a selection of total bet amounts. There are 12 of these in total and they range from just 10p to £100 per spin. We think you’ll agree, this upper betting limit is more than large enough for most players around. We thought the Wild Heist at Peacock Manor was an absolute winner of a title. It’s got it all – asolid look, feel, and theme. This is complemented by excellent and diverse gameplay features. We tried to work out just how many combinations of special features it was possible to have active at once during the game’s free spin mode and went cross eyed in the process! If you like slots with loads going on, that make you keep wanting to revisit them to see more, this one could well become a favourite of yours. We certainly got a kick from it! This game has a rating of 4 / 5 with 493 total reviews by the users.